Meltdowns. They can derail the best-laid lesson plans and dishearten even the best, most patient teacher. We know so many teachers who’ve been there. You want your inclusive class to be a warm, welcoming place where everyone learns–but then some days, too much of that precious learning time gets eaten up by meltdown management. So what can you do to defuse a meltdown before it even starts? In his book Freedom from Meltdowns, Dr. Travis Thompson offers some positive behavior support strategies teachers can use to help prevent meltdowns before they disrupt class time. Visual supports, he points out, can be an especially useful tool in meltdown prevention for students with autism, ADHD, or other disabilities (and as a bonus, they’re helpful reminders for all the kids in your classroom, too). 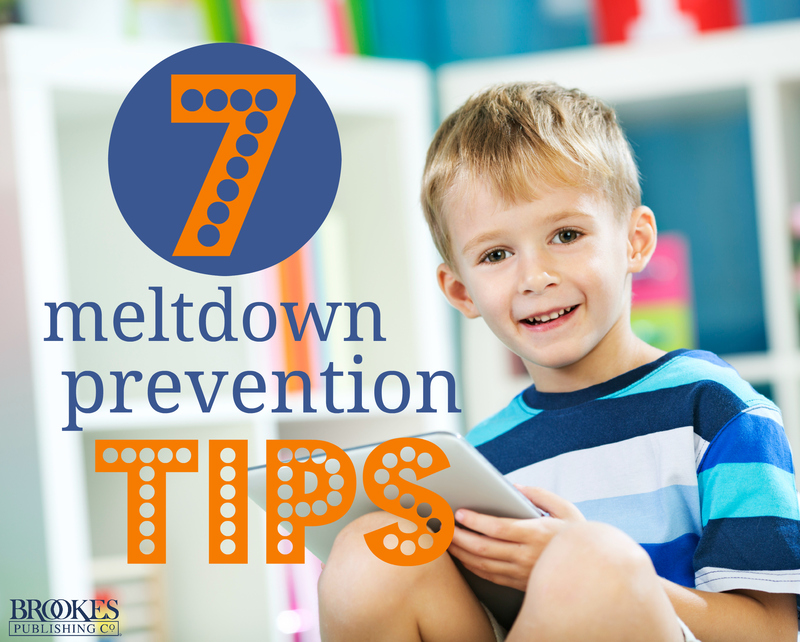 Here are 7 simple visual support ideas from Dr. Thompson’s chapter on meltdowns in school. Have you used any of these in your classroom? Many children–with and without disabilities–have trouble grasping the idea of boundaries. When a student doesn’t know what type of behavior is appropriate or expected in a certain area of the classroom, behavior challenges are much more likely to crop up. Visual reminders can help draw distinctions between different areas of the classroom and clarify what behaviors are appropriate in each one. Try colored strips of tape on the floor or wall, room dividers in bright colors, or painted walls with posters that double as labels. For example, you can paint the walls of your reading area blue and hang posters depicting expected behaviors: children reading quietly, a child holding an index finger to her lips in a “shhhh” gesture. Cue up the cue cards. Communication cue cards with visual prompts and reminders can be more effective than spoken verbal cues (and less likely to provoke arguing–it’s tougher to argue with a card than a person). Easy and inexpensive to make, these cards include photos that remind the child which activity is happening, serve as behavior prompts (“shhhh,” “use your pencil”), and/or remind them of expectations and rewards. A first”“then card, for example, is a great way to remind the student what she’s expected to do and what the reward will be for completing the task. Labeling kids = bad. Labeling your classroom materials = good. When students know exactly where and how to find what they need, they’re less likely to experience the frustration and confusion that can spark a meltdown. Label bins, cubbies, storage cabinets, shelves, and centers with clear and colorful words, photographs, drawings, or clip art illustrations. Do you use visual schedules in your classroom? A popular, effective way to help students keep track of the daily schedule, visual schedules give reminders of when activities happen and how they’re sequenced. They help make expectations crystal-clear and ease transitions–a time of day when meltdowns are likely to happen if a student feels surprised by or anxious about what’s coming next. Get creative, and always consider what type of visual schedule would appeal to each individual child! A task organizer is a special kind of visual schedule that walks students through an activity with multiple steps. Because task organizers help break an activity into manageable, bite-sized chunks, they’re especially helpful for students with ADHD and learning disabilities, many of whom need extra support with staying organized and focused. You can use task organizers as offshoots of larger visual schedules and activity schedule notebooks–the task organizer can be a small, hand-carried mini-schedule covering part of the day or breaking a specific activity into several substeps. Draw up a behavioral contract. When a student has frequent behavior challenges, it can help to give her an active role in setting behavior goals–and monitoring her progress. Sit down with her and draw up a behavioral contract together. Talk about what behaviors are desirable and undesirable, jointly identify goals to work toward, and decide on consequences. Once your student accepts the terms of a behavioral contract and experiences some success, gradually reduce the amount of direction you provide and encourage her to self-monitor her behavior more and more. If all goes well, revise the contract to allow for increased student direction. You might discover that after several months, your student can manage her behavioral program pretty much on her own–meeting with you from time to time to discuss new goals and reinforcers. What do you think? Will you try any of these ideas in your classroom? Is there another visual support strategy that’s worked for you? Add your thoughts in the comments below! Want a concrete example of a visual schedule? This post shows you how to create and use first-then visual schedules (includes a free printable you can use with your students). Looking for a visual timer that meets your students’ needs? Here’s a helpful post on 20 Visual Timers for Children with Special Needs. Need some guidance on creating a behavior contract? This site has tons of resources and printables for you.